Today(Mar27th) brought about the announcement of Sony’s(NYSE:SNE) plans to make a large international push in eReader device sales, bringing their products to nearly twice as many countries as currently enjoy them. The current list of the US, Canada, United Kingdom, France, Germany, Netherlands, Austria and Switzerland will be expanded to include Japan, China, Australia, Italy, Spain, and probably others. While in recent years we haven’t seen anything groundbreaking from Sony in terms of eReaders, they are really the ones that started the craze in the US with their PRS series. The current hardware offerings are easily as functional and easy to read as anything from their competition, they just lack a lot of the bells and whistles that more famous lines like the Kindle bring to the table. What Sony really has going for them in this initiative is the localization angle. Amazon(NASDAQ:AMZN) may have recently begun bringing international authors to the english-speaking arena, but Sony will be bringing countries around the world works in their native languages from local authors through partnerships with affiliated bookstores. This should have a strong appeal for potential buyers, given the overwhelming weight, at present, on the availability of books in the English language above all others. 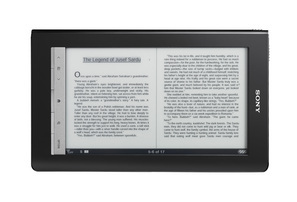 Maybe this will be what brings the Sony Reader back into more equal footing with the Kindle and nook? This entry was posted in E-Book Readers, Publishing and tagged International, PRS, Sony by matthew. Bookmark the permalink.